Aren’t Monday nights to be reserved exclusively for one’s family? What are the best evidences to support the authenticity of the Book of Mormon? The Spirit led Wilford Woodruff to a field prepared by the Lord. Wilford Woodruff could not help but wonder what would be the effect of the inspiration he felt that March day in 1840, during his first mission to England. He and Elder Alfred Cordon were already having some success at their missionary work in the Staffordshire Potteries district. But the voice of the Spirit was telling him to go elsewhere. This response to inspiration initiated one of the most fruitful missionary journeys in the history of the restored Church. President Woodruff spoke of the ensuing months in Herefordshire as one of the highlights of his life. He rejoiced in the revelation that called him there, always acknowledging the hand of the Lord in the rich spiritual harvest he helped gather. While proselytizing along the Atlantic Seaboard in 1838, he received notice that he had been called to become a member of the Quorum of the Twelve Apostles and to prepare himself to preach in England. Delayed by illness and the tasks of organizing the immigration of about fifty of his converts to Missouri, Wilford was unable to get any farther than Rochester, Illinois, when he learned of the forced expulsion of his fellow Saints from Missouri, late in 1838. He stayed in Illinois, moving his family to Quincy in the spring of 1839. To fulfill an earlier commandment that those leaving for the British Isles ought to depart from the temple site in Far West, Missouri (see D&C 118:5), Wilford and his fellow missionaries traveled back to the area from which the Saints had recently been forceably evicted. On 26 April 1839, Wilford, along with George A. Smith, was ordained an Apostle. He then returned to Illinois, settled his young family in Montrose, Iowa, and in spite of serious personal illness, started for England on 8 August 1839.3 With several other members of the Quorum of the Twelve, Elder Woodruff arrived in Liverpool on 11 January 1840. The first LDS missionaries had arrived in England in July of 1837. Heber C. Kimball, Orson Hyde, and several others had concentrated their efforts in the areas north and east of Liverpool, particularly in Preston and Manchester. By early 1840, there were approximately 1,500 members of the Church in England. The coming of the group of apostolic missionaries would see the work greatly expanded. 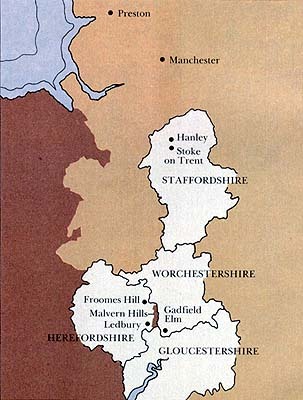 Maps show detail of the Herefordshire area. His missionary work in the Staffordshire Potteries illustrates the proselyting techniques of early missionaries. Traveling without purse or scrip, they usually made their first contacts with Church members, or members’ friends or relatives. Various individuals willingly shared their houses and food with the missionaries. Then the elders used these homes as bases of operation for sorties into the regions nearby. Elder Woodruff thus preached at William Hume’s home in Stoke, dined and slept at Isaac Whittaker’s in Burslem, and preached at a Brother Wood’s in Newcastle. Through these people, he gained access to dozens of other homes. He preached basic principles of the gospel, rehearsed the early history of Joseph Smith, discussed the Book of Mormon, and bore testimony about the importance of the Restoration. He answered questions, sometimes dodged rotten eggs from hecklers, and distributed tracts to those who wished to read further about the restored gospel. Almost all his traveling was done on foot. He regularly recorded in his journal the distance he had walked; during this period he averaged between four and eight miles per day. From January 22 to March 2, Elder Woodruff worked hard as a missionary in the various towns around Stoke-on-Trent. Of particular interest was his relationship with William and Ann Benbow in Hanley. William was the keeper of a provision store at the Hanley Market Place. He and his wife had already joined the church through the efforts of Alfred Cordon and were strong in the faith. It was probably through the Benbows of Hanley that Wilford learned of John Benbow of Herefordshire﻿—and more particularly of the United Brethren, of which John was a member. The day after he celebrated his thirty-third birthday, Elder Woodruff recorded in his journal, “The Lord warned me to go to the south.”7 And so he began his eighty-mile journey. 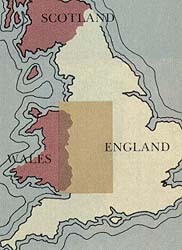 Herefordshire would subsequently prove to be one of the most successful missionary areas in nineteenth-century Britain. Unlike the Potteries area, Herefordshire was predominantly rural, with most of the land devoted to agriculture, particularly to a variety of fruit orchards. Its farms and orchards helped to supply industrial towns with foodstuffs; no doubt William Benbow’s store in Hanley was supplied with Herefordshire produce. William’s brother John was a well-to-do farmer who lived near Ledbury. He seems to have been a tenant farmer, essentially leasing about three hundred acres of land. (Following his conversion to the Church, he was evicted from the property.) Thus, in company with William Benbow, Wilford Woodruff arrived in Herefordshire and sought out John Benbow. It was John Benbow’s home that provided Elder Woodruff his first preaching location in the Herefordshire area.8 This was particularly important because of John Benbow’s connection to the United Brethren, a break-off from the Primitive Methodists. It was a connection that soon opened many other homes to Elder Woodruff. In a real sense, the United Brethren were to early LDS missionary work in Herefordshire what the Campbellites had been to Latter-day Saint proselytizing in 1830 in Ohio.9 For here was a group, just like the followers of Sidney Rigdon earlier, who had been prepared for the message of the Restoration. About six hundred individuals living in the larger Herefordshire area, many of them from among the poorer classes, had broken with the Methodist movement begun by John Wesley because of its growing wealth and formalism. They had gathered around the leadership of Thomas Kington, and about 1834 the group had been expelled from the Primitive Methodists, a smaller schism from the Methodist movement. They had about forty lay preachers who were providing leadership and preaching when Elder Woodruff arrived in March 1840. Elder Woodruff took every opportunity to preach to these people after his arrival on March 4. By March 16, he had obtained a preaching license from a local magistrate. The fact that many of the homes of the United Brethren had been already licensed as preaching locations provided ready-made centers for his work. The pivotal convert was Thomas Kington, Superintendent of the United Brethren. Elder Woodruff recorded that on March 17 he “lade the whole work of the fulness of the gospel before him & he seemed to receive the testimony.” On March 21, Brother Kington was baptized, and the next day Elder Woodruff ordained him an elder. During Brigham Young’s visit, the Church leaders obtained from John Benbow a donation of £300 to be used for printing the Book of Mormon.12 This first European edition consisted of 5,000 copies and appeared in 1841. (Always a generous man, Brother Benbow later gave £100 to help about fifty individuals emigrate to America.) Shortly afterward, Brigham Young returned to Manchester to see several publishing projects through to completion. By the middle of May 1840, it is estimated that more than 320 people in the area had joined the Church.14 Elder Woodruff’s journal records the variety of spiritual experiences that accompanied this growth. There were healings (a woman, Mary Pitt, who had walked only with crutches for eleven years, was healed through the laying on of hands) and various visions and dreams that united new members and strengthened their faith. These experiences helped to create more fully a community of Saints. In July 1840, Elder Woodruff traveled to Manchester to attend a general conference. On July 6, he reported 1,007 members in the Herefordshire and Gloucestershire areas.18 Four days before, he had recorded in his journal a vision of Ann Booth,19 in which she had seen the redemption of John Wesley and many of his followers. Perhaps he sensed a connection with his own very successful work among the United Brethren. With a firm foundation established, Elder Woodruff felt no need to confine his activities to this area. Thus, after a short visit to the Ledbury area, he left to help open the city of London to the gospel on August 17. He visited the Herefordshire area briefly again in September, but feeling the members there were remaining strong in the Church, returned to London. He stayed in London until February 1841, helping to lay the foundations of the Church there. He once again visited the Herefordshire area in March on his way to Manchester for a final conference prior to returning to America. On 6 April 1841, Elder Woodruff reported 1,410 members in the Gadfield Elm and Froome’s Hill Conferences.20 Combined, they were the largest single group of LDS converts in those early years. In Journal of Discourses, 15:342–43. Dean C. Jessee, “The Kirtland Diary of Wilford Woodruff,” Brigham Young University Studies, Summer 1972, pp. 365–99; and Donald Q. Cannon, “Wilford Woodruff’s Mission to Maine,” Improvement Era, Sept. 1970, pp. 82–86. Sources on Wilford Woodruff include his fifteen-volume journal. The manuscript is in the Historical Department, The Church of Jesus Christ of Latter-day Saints, Salt Lake City, Utah. The journal is now available in a nine-volume typescript edition, volume one of which contains the entries relating to our topic here. (Salt Lake City: Signature Books, 1983–1985). A biography that depends heavily on the journals is Matthias F. Cowley, Wilford Woodruff, History of His Life and Labors (Salt Lake City: Bookcraft, 1964; originally published in 1909). George A. Smith to C. C. Waller, 6 June 1840 in Times and Seasons, 15 Nov. 1840, p. 223. Wilford Woodruff Journal, 20 January 1840. In all citations from his journal, original spelling and grammar are retained. Wilford Woodruff Journal, 22 January and 26 June 1840. Wilford Woodruff Journal, 2 March 1840. Wilford Woodruff Journal, 4 and 5 March 1840. See Milton V. Backman Jr., The Heavens Resound: A History of the Latter-day Saints in Ohio, 1830–1838 (Salt Lake City: Deseret Book Co., 1983), pp. 1–19. 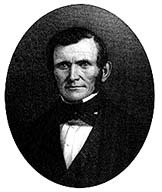 For information on the United Brethren, see Wilford Woodruff Journal, various dates after 2 March 1840, and two letters of Wilford Woodruff: 29 April 1840 in Times and Seasons, June 1840, p. 122; and 7 October 1840 in Times and Seasons, 1 March 1841, pp. 326–27. Also see Diary of Job Smith, Historical Department, The Church of Jesus Christ of Latter-day Saints, pp. 1–5; and Job Smith, “The United Brethren,” Improvement Era, July 1910, pp. 818–23. See Wilford Woodruff Journal under dates of May 9, 11, 20 and 22 for especially moving descriptions of these experiences. Wilford Woodruff Journal 14 and 19 May 1840. Letter of John Taylor dated 16 March 1840, Liverpool, cited in Times and Seasons, May 1840, p. 110. See also Wilford Woodruff’s letter of 29 April 1840 in Times and Seasons, June 1840, p. 122. It should be noted that these “preachers” were lay preachers, not professional clergy. See letter of Willard Richards, dated Ledbury, 15 May 1840, in the Millennial Star, May 1840, p. 23; also Wilford Woodruff Journal, the volume for 1840, where the names of those he baptized are recorded. In his Journal for 1 June 1840, Elder Woodruff noted, “The Churches in Herefordshire Now No[.] 402.” The number was 502 by June 20. The minutes of this conference were published in the Millennial Star, Aug. 1840, pp. 84–85. They include the names of the presidents of the branches, many of whom had been preachers for the United Brethren. See minutes of the 21 June 1840 conference at Stanley Hill in the Millennial Star, Aug. 1840, pp. 86–89. Wilford Woodruff Journal, 22 June 1840, p. 467. See conference minutes, Millennial Star, Oct. 1840, p. 165. A vision of 12 March 1840. See Wilford Woodruff Journal, 2 July 1840. See his letter of 29 March 1841 in Times and Seasons, 1 June 1841, p. 435; and the Manchester Conference minutes in the Millennial Star, April 1841, pp. 301–5. The figure of 1,410 presumably does not include those who had emigrated by that time. In Journal of Discourses, 18:124. In Journal of Discourses, 15:245. David J. Whittaker, University Archivist at Brigham Young University, is a Gospel Doctrine teacher in his Provo, Utah, ward. Right: The pond at Benbow Farm as it looks today. Far left: A view of the Malvern Hills today. Herefordshire Beacon is the prominent point at the left. Left: Ruins of the Gadfield Elm chapel. Elder Woodruff established the Gadfield Elm Conference (the equivalent of a modern stake) on 14 June 1840. Bottom: Brigham Young about 1844.